Best Budget Rates for Top Quality Cruises! We invite you to cruise with us in comfort and style around the archipelago of Langkawi's 104 tropical paradise islands (only 99 at high tide!) and tranquil emerald green seas aboard our classic 72ft Indonesian yacht "HALLELUJAH" . . . While Penang - 60 nautical miles south - is famously known as the "Pearl of the Orient," the legendary islands of Langkawi Archipelago - an area covering over 500 square kilometres - deserve their own claim to fame as the "Jewels of Kedah." So come and experience for yourself . . .
Fun under the Sun on . . .
We're just waiting to hear you shout out . . .
"Ahoy there! Hallelujah! Here we come!" But first, read our . . .
TRIP ADVISOR BRAVO BADGE AWARDED! Click the Badge to see what our guests say . . . Simply step aboard, relax, and you'll find out! Watch for Flying Fish, Skipping Long Toms, Dolphins, Sea Otters, Hornbills, Kingfishers, Monkeys and huge Monitor Lizards - cousins of the infamous Komodo Dragons! Entice giant Sea Eagles & Brahminy Kites to dive and pick up tasty floating morsels in their talons as they fly so close to the boat! Enjoy the panorama of spectacular seascapes & sunsets surrounded by the tropical islands of equatorial jungles, ancient limestone formations and pristine uninhabited beaches of the Langkawi islands. Take fantastic photos & videos, make new friends and have a swim. Help yourself to a superb home-cooked Full Buffet and order your refreshing drinks from our Free Flow Bar! It doesn't get much cheaper than that! So ask yourself . . .
We can even offer you . . . Extra Discounts on Full Advance Confirmation! What!? Still can't afford it? Then go for our . . .
"BYO Special Private Party Cruises"
That's right! 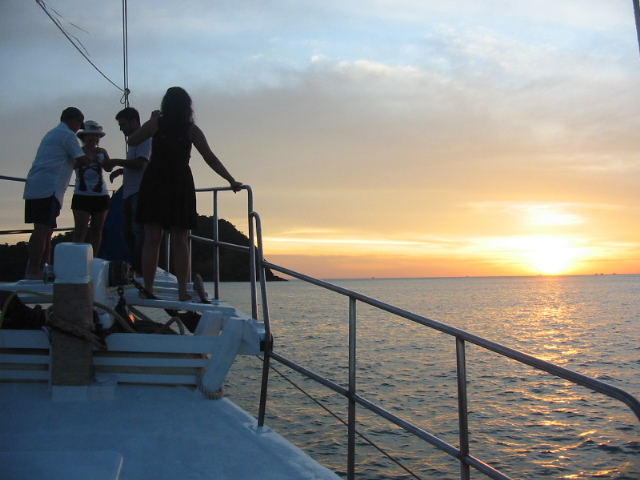 Only RM 150 for a Sunset Cruise! Now surely that's an offer you can't refuse! So BYO & Away We Go!
. . . or . . . archiadven@hotmail.com . . . or call us any time at . . . Please also note . . .
a) Compliant with Malaysian Marine Department Survey Standards, "HALLELUJAH" is fitted with Full Safety Equipment on board and is officially registered as a commercial vessel. c) Captain Hugo is also a fully certified Malaysian Red Crescent First Aid & CPR Practitioner as well as a Qualified Nurse. d) Passenger Certificate, Captain's Licence & Malaysian Red Crescent Certificate all issued by Marine Department/Jabatan Laut Malaysia. e) The Captain's wife, Joanna, is also a certified yacht skipper holding the Powered Pleasure Craft Driving Licence issued by the Maritime and Port Authority of Singapore (MPA). Since you're in such safe hands . . .
. . . for a truly unique and best value yacht cruise experience, we look forward to personally welcoming you soon as our special guests aboard The Good Ship "HALLELUJAH" and sharing our hospitality with you. Rock Bottom Rates for Top Quality Cruises!
. . . with that personal touch that makes all the difference. So if you really want to enjoy yourselves . 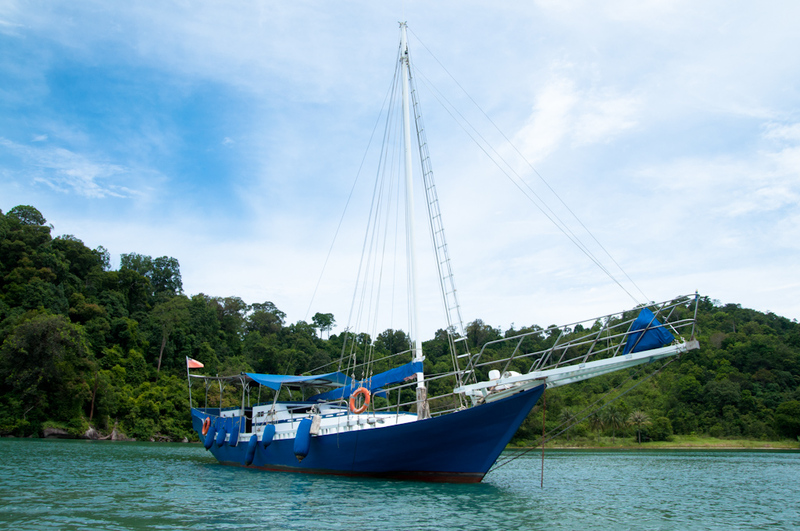 . .
PS: LANGKAWI HALLELUJAH YACHT CRUISES is now also for sale! Owner retiring after 30 years. Price reduced! Terms & Conditions negotiable. For full details of this unique and lucrative Malaysian business opportunity, click the link . . .
HALLELUJAH Yacht Charter Business for Sale! For full details, check it out here . . .
Brief videos cruising from Thailand to Malaysia . . . . Copy & paste the link . . .